Nope, these aren’t the Royal Exclusiv Vertex Alpha cone skimmers that have been on the market for a couple of years. Instead, these are Bubble King branded cones complete with a double cone, mini Red Dragon pump, and titanium screws throughout. This new skimmer also features a much softer looking cone shape that has more of a curvature than other traditional cones. This design, coupled with a cone over the bubble plate, is supposed to lend itself to greater efficiency. 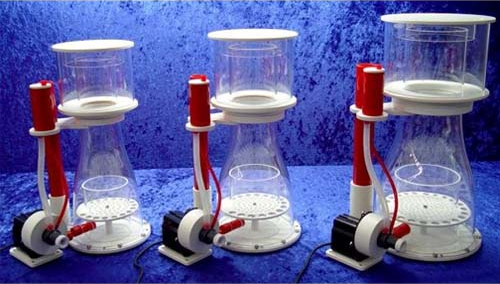 The Bubble King cone skimmer will come in three sizes, the 180, 200, and 250. The prices will start at $1140 for the 180, climbing to $1550 for the 250. As for tank size ratings, the 180 can handle tanks up to 500 liters (roughly 130-gallons). The 250 is rated for 1500L, or about 400-gallons. And as with the other BK skimmers, these will have loads of sound deadening rubber feet and a silicone decoupler for the pump. These cone skimmers aren’t quite available, with the exception of pre-orders, but should be in a couple of weeks.